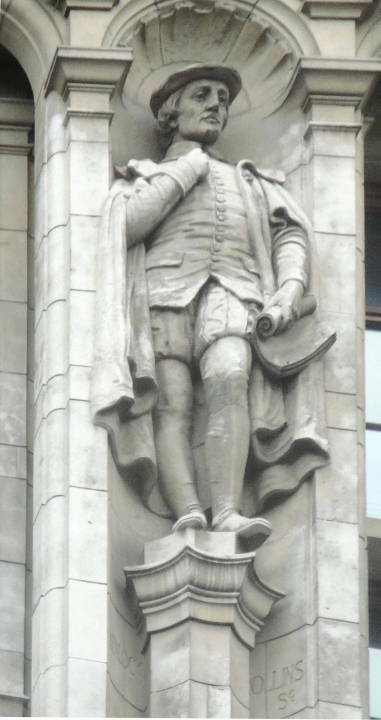 John Thorpe by John Wenlock Rollins (1862-1940). Cromwell Road façade of the Victoria and Albert Museum, London. “John Thorpe or Thorp (c.1565-1655? 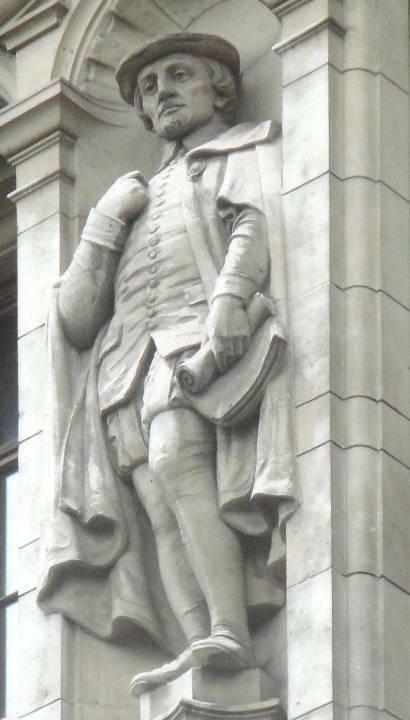 ; fl.1570-1618) was an English architect” about whom little is known and, according to a tongue-in-cheek Wikipedia article, he has been credited with buildings erected when he was all of five years old. The Victorians sought to find or create national traditions in the visual and literary arts, and the movement from scholarship to myth that we see in Rollins's Thorpe derives from the same desire to root nineteenth-century creations in an attractive past that we see in the more historically accurate editing of medieval and renaissance texts and the collecting of folklore and ballads. Photographs and caption by Robert Freidus. Formatting, perspective correction, and commentary by George P. Landow. [You may use these images for any scholarly or educational purpose as long as you (1) credit the photographer and (2) link to this URL in a web document or cite it in a print one. “John Wenlock Rollins.” Mapping the Practice and Profession of Sculpture in Britain and Ireland 1851-1951. University of Glasgow History of Art and HATII, online database 2011. Web. 18 May 2011.